ECONOMY 224 • SHOPPING CENTER BUSINESS • May 2017 ils of prosperity" do not impose unneces- sary limitations on your growth during a strong economy. One is to prioritize building a profes- sional culture where employees are fo- cused on long-term prospects — both in terms of properties and personnel. Do your part to promote vocational training and support tradesmen and other quali- fied specialists. Internally, that means im- plementing and maintaining high quality training programs, and an emphasis on treating those specialists and trainees like the valued employees they are. While there is little an individual orga- nization can do to influence the broad- er market for raw materials, you can be careful what you promise, and be more strategic when it comes to timelines and financial planning. Look closely at his- torical trends and be sure to budget and schedule with plenty of room for error. As for overbuilding, developers need to tamp down their optimism and take some personal responsibility — striking a balance between capitalizing on develop- ment opportunities while the economy is still in good shape and contributing to a bubble mentality that will ultimately serve no one's interests. Above all, simply be aware that pros- perity is not a panacea for poor business practices. A strong economy is no excuse to let efficiency slip or to minimize the importance of sound decision-making. Those consistent points of emphasis will ensure that developers and property man- agers are able to navigate a competitive industry successfully — both in good times and in bad. SCB Richard Broder is CEO of Broder & Sachse Real Estate, Inc., a real estate development company based in Birmingham, Michigan. 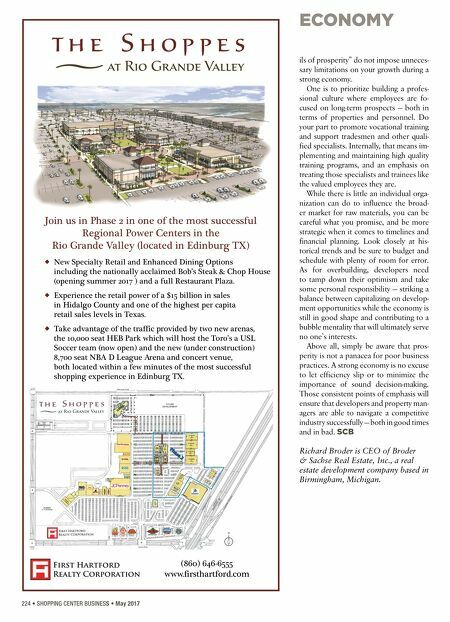 (860) 646-6555 www.firsthartford.com Join us in Phase 2 in one of the most successful Regional Power Centers in the Rio Grande Valley (located in Edinburg TX) u New Specialty Retail and Enhanced Dining Options including the nationally acclaimed Bob's Steak & Chop House (opening summer 2017 ) and a full Restaurant Plaza. 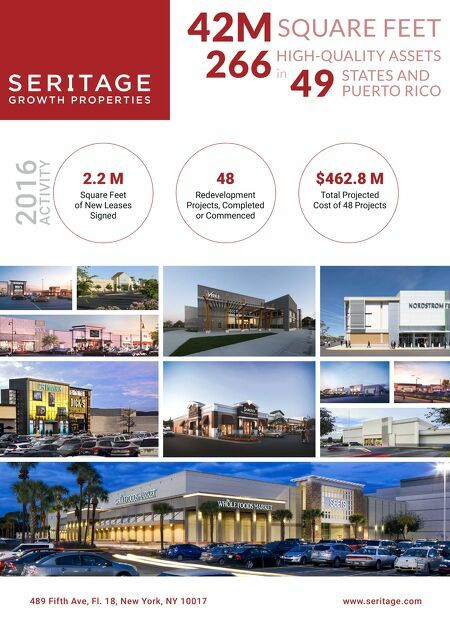 u Experience the retail power of a $15 billion in sales in Hidalgo County and one of the highest per capita retail sales levels in Texas. u Take advantage of the traffic provided by two new arenas, the 10,000 seat HEB Park which will host the Toro's a USL Soccer team (now open) and the new (under construction) 8,700 seat NBA D League Arena and concert venue, both located within a few minutes of the most successful shopping experience in Edinburg TX.